Luke 22:47-53. While He was speaking, behold a multitude came; and he that was called Judas, one of the twelve, went before them, and drew near to Jesus to kiss Him. For he had given them this sign, "Whomsoever I kiss is He." But Jesus said to him, "Judas, do you betray the Son of man with a kiss?" But when they that were with Him saw what was about to be done, they said, "Lord, shall we smite with the sword?" And one of them struck the servant of the chief priest, and cut off his right ear. But Jesus answered, and said, "Let alone thus far." And He touched his ear and healed him. And Jesus said to those who had come out against Him, and who were the chief priests, and captains of the temple, and elders, "Are you come out as against a thief with swords and staves to take Me? When I was daily with you in the temple, you stretched not out your hands against Me, but this is your hour, and the power of darkness." Many and bitter passions wage war with the soul of man, and, attacking it with unendurable violence, humble it to unseemly deeds, but worse than all the rest is that root of all evil, the love of money, into whose inextricable nets that traitorous disciple so fell, that he even consented to become the minister of the devil's guile, and the instrument of the wicked chiefs of the synagogue of the Jews in their iniquity against Christ. And this the purpose of the evangelic lessons again plainly shows. For the Savior had forewarned the holy apostles that He should be seized, and endure by the hand of sinners His passion upon the cross. And with this He also commanded, that when temptation pressed upon them they must not be weary, nor sleep at an unseasonable time, but rather must watch and be constant in prayers. When then He was still speaking of these things, "Behold," it says, "a multitude came, and he that was called Judas, one of the twelve, went before them." Do you see that the blessed Evangelist grieves, and, so to speak, even faints? For he does not permit himself even to retain in his remembrance the disciple who was so easily bought. He refuses even to name that wicked one, for he says, "he that was called Judas." For what? Did he not know that the man was numbered with the elect, and counted in the company of the holy apostles? But, as I have already said, he hated even his name, and therefore the expression, "he that was called Judas." To this, however, he adds, that he was one of the twelve. And this also is a matter of great importance to demonstrate more fully the guilt of the traitor's crime. For he who had been equally honored with the rest, and adorned with apostolic dignities; he, the elect and beloved, deigned admittance to the holy table, and the highest honors, became the pathway and the means for the murderers of Christ. What lamentation can suffice for him, or what floods of tears must not each shed from his eyes, when he considers from what happiness that wretched being fell into such utter misery! For the sake of worthless money he ceased to be with Christ, and lost his hope toward God, and the honor, and crowns, and life, and glory prepared for Christ's true followers, and the right of reigning with Him. It will be worthwhile, however, to see what the nature was of his artifice. He had given then those murderers a sign, saying, "Whomsoever I kiss is He." Completely had he forgotten the glory of Christ, and in his utter folly imagined perhaps that he could remain undetected when offering indeed a kiss, which is the type of love, but with his heart full of bitter and iniquitous deceit. And yet even when he was accompanying Christ our common Savior in His journeys with the other apostles, he often had heard Him foretelling what was about to happen. For, as being God by nature, He knew all things, and expressly told him of his treachery; for He said to the holy apostles, "Verily I say to you, that one of you betrays Me." How then could his purposes remain unknown? No, but there was the serpent within him struggling against God; he was the dwelling-place of the devil, for one of the holy evangelists has said, that as he was reclining at table with the rest of the disciples, the Savior gave him a piece of bread, having dipped it in the dish, "and after the bread Satan entered into him." 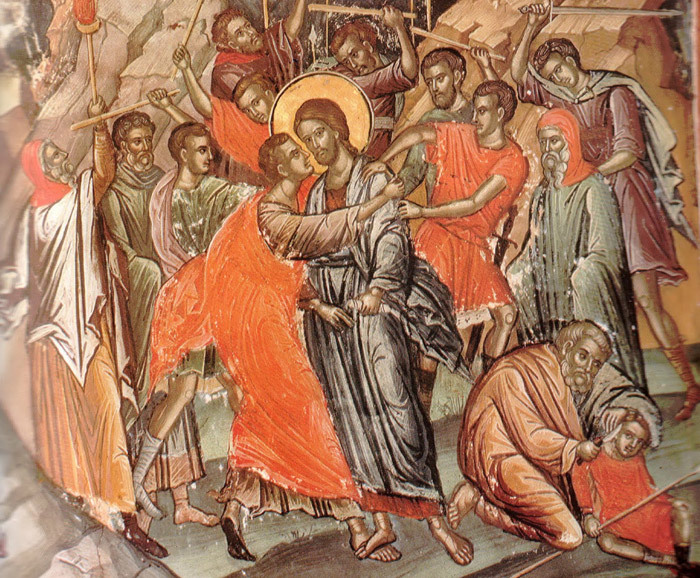 He approaches Christ therefore as one beside himself with wine; and though the instrument of fraud and treachery, he makes a show of extraordinary affection, and therefore Christ very justly condemned him with the greater severity, saying, "Judas, do you betray the Son of man with a kiss?" And Matthew says, that when the traitor drew near to Christ, our common Savior, he both kissed Him, and added thereto, "Hail, Master." Do you say hail to Him Who by your instrumentality is made the prey of death? How could such a word possibly be true? So that we see, that inasmuch as that false one, Satan, was within Him, he used falsehood even in saying, Hail. Because of such deeds the prophet somewhere says, "Their tongue is a piercing spearhead. The words of their mouth are deceitful. To his neighbor he speaks things of peace, but in his soul there is enmity." But further, we must also call to mind what is written by the divine John respecting this event; for he has related, "that the officers of the Jews drew near to seize Jesus, and He advanced to meet them, saying, 'Whom seek you?' When then the officers said, 'Jesus of Nazareth,' He yielded Himself into the hands of those murderers, saying, 'I am He.' But they, it says, fell back; and this happened three times." What therefore was the purpose of this? And for what reason did the Savior offer Himself to them, but they fell down when they heard Him say, "I am He?" It was that they might learn that His passion did not happen to Him without His own will, nor could they have seized Him, had He not consented to be taken. For it was not the effect of their own strength that they took Christ, and brought Him to the wicked rulers, but He yielded Himself up to suffer, as well knowing that His passion upon the cross was for the salvation of the whole world. And the blessed disciples, pricked with the goading of divine love, drew their swords to repel the attack. But Christ would not permit this to be done, but rebuked Peter, saying, "Put your sword into its sheath, for all who take up the sword shall die by the sword." And herein He has given us also a pattern of the manner in which we must hold fast by our love to Him, and of the extent to which the burning zeal of our piety may proceed. For He would not have us use swords wherewith to resist our enemies, but rather employing love and prudence, we so must mightily prevail over those who oppose us. And similarly Paul teaches us, saying, "Casting down reasonings and every high thing that exalts itself against the knowledge of God, and bringing captive every thought to obedience to Him." For the war for truth's sake is spiritual, and the panoply that becomes saints is intellectual, and full of love to God. "For we must put on the breastplate of righteousness, and the helmet of salvation; and take the shield of faith, and the sword of the Spirit, which is the word of God." And so then the Savior moderates the unmeasured zeal of the holy apostles, and by preventing the example of such an act, declares that those who are the chief in His religion have no need in any way whatsoever of swords. And He healed with divine dignity him who had received the blow, so giving to those who came to seize Him this godlike sign also for their condemnation. But that no one prevailed by force over His power and will, He shows by saying; "Are you come out as against a thief with swords and staves to take Me? When I was daily with you in the temple, you stretched not out your hands against Me." Does Christ then blame the chiefs of the Jews for not having prematurely contrived for Him the deadly snare? Not such is His meaning, but this rather: when it was easy for you to take Me, as each day I taught in the temple, you seized Me not. And why? Because I did not will as yet to suffer, but rather was waiting for a fitting season for My passion. And this season has now arrived, for be not ignorant that "this is your hour and the power of darkness," that is, that a short time is granted you during which you have power over Me. But how has it been given you, and in what manner? By the will of the Father consenting thereunto with My will. For I willed that for the salvation and life of the world I should submit Myself to My passion. You have therefore one hour against Me, that is a very short and limited time, being that between the precious cross and the resurrection from the dead. And this too is the power given to darkness, but darkness is the name of Satan, for he is utter night and darkness, and the blessed Paul also says of him, "that the god of this world has blinded the minds of those that believe not, lest the light of the gospel of the glory of Christ should shine to them." Power therefore was granted to Satan and the Jews to rise up against Christ, but they dug for themselves the pitfall of destruction. For He indeed saved by means of His passion all under heaven, and rose the third day, having trampled under foot the empire of death, but they brought down upon their own heads inevitable condemnation in company with that traitorous disciple. Let them hear therefore the Holy Spirit, Who says by the voice of the Psalmist, "Why have the heathen raged, and the nations meditated vain things? The kings of the earth stood up, and the rulers were gathered together against the Lord and against His Christ." But what follows this? "He that dwells in heaven," it says, "shall laugh at them, and the Lord shall deride them." These wretched beings then involved themselves in the crime of murdering their Lord; but we praise as our Savior and Deliverer our Lord Jesus Christ, by Whom and with Whom to God the Father be praise and dominion, with the Holy Spirit, forever and ever, Amen.